Despite dissent in many quarters, Piaget's epistemology and the developmental psychology derived from it remain the most powerful theories in either field. From the beginning, Piaget's fundamental epistemological notion was that all knowledge is rooted in action, and for a long time, he identified action with transformation. What is known is that which remains constant under transformatory action. This book represents a fundamental reformulation of that point of view. Alongside transformatory schemes, Piaget now presents evidence that nontransformatory actions -- comparisons that create morphisms and categories among diverse situations constitute a necessary and complementary instrument of knowledge. This work aims to elucidate that insight experimentally and theoretically and to understand the developmental interaction of comparing and transforming as knowledge is constructed. This first English translation of Piaget's work includes studies of children's understanding of geometric forms, machines, and abstract concepts. It contains a clear statement of his mature position on continuity with biology as well as with the history of ideas. "…develops a novel interpretation of the construction of knowledge. It is a collaborative and interdisciplinary study, including contributions from three mathematicians with an expertise in category theory". "… offers a rich description of one of the most interesting attempts to use a very sophisticated form of the continuity hypothesis as a guide to experimentation." Contents: T. Brown, About the Translation. S. Papert, Preface. With Cl. Monnier, J. Vauclair, Rotations and Circumductions. With D. Voelin-Liambey, I. Berthoud-Papandropoulou, The Composition of Two Cyclic Successions. With A. Moreau, The Rotation of Cubes. With I. Fluckiger, M. Fluckiger, Compositions and Conservation of Lengths. With E. Marti, E. Mayer, The Composition of Differences. With H. Kilcher, J.P. Bronckart, The Sections of a Parallelepiped and a Cube. With C. Bruhlhart, E. Marbach, Correspondences of Kinships. With A. Karmiloff-Smith, A Special Case of Inferential Symmetry: Reading a Road Map Upside Down. With A. Karmiloff-Smith, Conflicts Among Symmetries. With Cl. Voelin, E. Rappe-du-Cher, Correspondences and Causality. With F. Kubli, Equilibrium of Moments in a System of Coaxial Disks. With A. Blanchet, E. Ackermann-Vallad o, Comparison of Two Machines and Their Regulators. 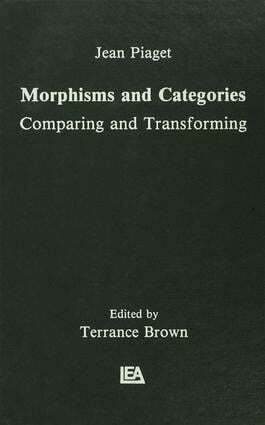 G. Henriques, Morphisms and Transformations in the Construction of Invariants. E. Ascher, The Theory of Categories and Genetic Epistemology. General Conclusions.